Max. 24 characters per line. ALL CAPS. A-Z, 0-9, !, &, space & line. 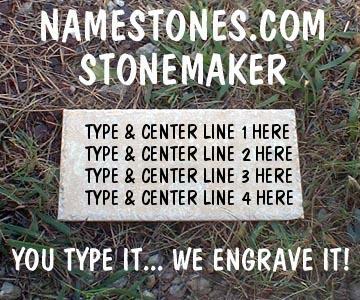 Welcome to the Namestones.com STONEMAKER. You can design your own custom message on a sample stone to see approximately how it will look as a finished product, then email it to yourself or someone else. IMPORTANT: the STONEMAKER tool will generate an APPROXIMATE image of the stone. However, when ordering a real stone, the image we send you in the CONFIRMATION email will be EXACTLY how the finished product will look. STEP 1: Type your text in the 4 lines in the boxes in the upper left (you can leave lines 2, 3 or 4 blank if you wish). LIMIT IS 24 CHARACTERS PER LINE. The STONEMAKER makes all the text the same size, but you can specify MAKE LINE 1 BIGGER, etc. when ordering the real stone. 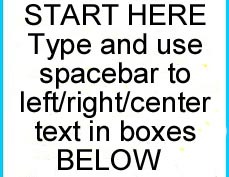 STEP 2: Use the spacebar to center the text or to left or right justify. Note that when ordering a real stone, all text is CENTERED unless otherwise noted. You can also play around with the TOOLS on the left by typeing in different values to make the text bigger/smaller or move it around on the stone. STEP 3: After you have typed in your text and adjusted it, then click CREATE. Your image will appear below along with the link code for the image for future reference. You can also send the image INSTANTLY to yourself or others with the email form below! Have FUN and be CREATIVE! After generating image, be sure to copy and paste the "direct link" box in your browser address line and bookmark it for future reference!